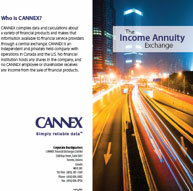 The CANNEX Income Annuity Exchange is an online service that provides annuity quotations, detailed illustrations and comparative surveys on behalf of companies representing the majority of annuities issued in Canada. The key to the accuracy and timeliness of the annuity quotations and surveys provided by CANNEX is that participating companies provide CANNEX with their mathematical algorithms used to calculate the annuity values. CANNEX works with insurance carriers to manage their rates and payout algorithms on a platform that efficiently distributes their annuity information to multiple parties on their behalf. Distributors and service providers need only go to one source for up-to-date guarantees and illustrations to support their annuity sales and service processes. Also available are data feeds of either historical quotes or current quotes to support research and market intelligence. Monthly incomes based on a single life, male, 10 year guarantee and premium of $100,000 of non registered funds. Payments will commence in one month. Prepared by CANNEX on April 21, 2019 at 18:00:06 ET.